Design-build project executed on a collaborative basis between the RD engineer and Sevenson at the direction of the client. Regularly scheduled project planning sessions, on-going constructability reviews and updated pricing for each phase of work resulted in achieving established project goals and objectives. Excavation, staging and storage of 49,000 CY of hexavalent chromium contaminated soils above NJDEP soil cleanup criteria. Segregate soils for offsite disposal or re-use onsite based upon results from sampling and analytical testing. Installation and operation of a 200 GPM temporary groundwater treatment system to process all water encountered during remediation. Installation of 2,400 lf of low permeability steel sheeting to depths of 50 ft BGS to serve as a hydraulic barrier down gradient of the site as well as proactive shoring for deep excavation. Installation of a hydraulic barrier cap system consisting of pipe, geotextile, drainage layer, connections to discharge locations, and fill material. Study Area 5 (SA-5) includes three (3) properties in Jersey City, New Jersey. The site was used for commercial and industrial activities for much of the past 100 years. Historically, the area was contaminated by hexavalent chromium from Chromium Ore Processing Residue (COPR), which was stored and utilized as fill material. Remedial action was implemented as part of proposed redevelopment of the site by New Jersey City University and in compliance with an Administrative Consent Order (ACO) entered into by the PRP and the New Jersey Department of Environmental Protection (NJDEP). Prevent exposure to soil containing hexavalent chromium above the NJDEP Soil Cleanup Criteria. Remove soils that could be disturbed by future site redevelopment and reuse acceptable soils within areas scheduled to be capped. Prevent the potential for future exposure to impacted soils. Prevent the potential for surface water infiltration and leaching of chromium from fill soils to groundwater. Prevent off-site migration of chromium concentrations above the groundwater quality standards. Reduce chromium concentrations in groundwater. Prevent exposure to groundwater with chromium concentrations above the groundwater quality standards. During RD Sevenson participated in regularly scheduled project planning meetings with the remedial design engineer at the request of the client. The meetings included constructability reviews and updated estimates for each scope of work item. The goal of these planning sessions was to identify best construction practices, develop value engineering approaches and understand the true cost of the work. Because of success of this collaborative approach it was decided that the RA phase implementation be executed by Sevenson with oversight from the RD engineer. Upon award of the remedial action contract, Sevenson mobilized to the site initiated construction of on-site access roads/haul routes; a temporary site entrance; and utility identification. The site was secured with chain-link fencing on concrete barriers with privacy screen and gates around the work perimeter. Sevenson constructed an equipment/materials storage area; hazardous waste staging and storage areas; equipment/personnel decontamination areas; scale system; and dust controls. Soil erosion and sedimentation control measures were initiated to prevent exposure to hexavalent chromium-contaminated soils. Sevenson excavated soils in designated areas, installed a barrier cap system, and restored disturbed areas by backfilling and grading. The barrier cap system with drainage controls were constructed to ensure maintenance of a negative gradient within the capped area, and hydraulic barriers were placed along the down gradient perimeter and property line to isolate remediated areas from adjacent properties. Site restoration was completed utilizing clean fill and paving. Sevenson conducted post-excavation surveys for each excavation area and a final, site-wide post construction survey to determine excavation volumes, fill volumes and restored surface areas, for the disturbed and restored footprint plus an additional 25 ft beyond the site perimeter. A total of 49,000 CY were excavated.Excavation of impacted soils was done down to, and some instances, into the existing meadow mat which separated the impacted on-site soils form an aquifer. This required surgical excavation techniques in order to limit the amount of meadow mat removal and thereby help to limit the amount of upwelling groundwater which had to be collected and subsequently pre-treated prior to discharge to the city POTW. The areas of excavation into the meadow mat were covered with a Geocomposite Clay Liner (GCL) and backfilled in order to maintain the continuity of the meadow mat barrier in order to limit future groundwater upwelling to occur. Sevenson constructed a water treatment system to manage all water recovered by the dewatering system so excavations could be done in dry conditions. 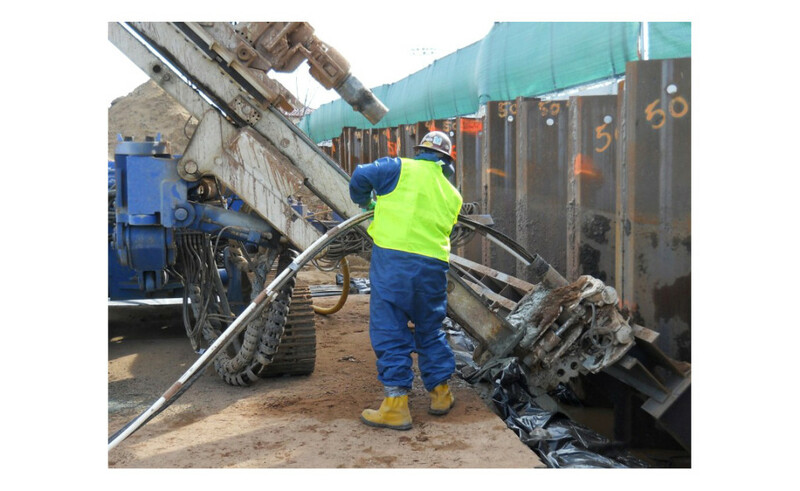 Sevenson installed deep dewatering wells and installed necessary sumps to accomplish dry conditions. Dewatering was done utilizing the deep well system and/or sumps to maintain ground water a minimum 2 ft below excavations, allow for liner placement, backfill and compaction. The treatment plant also included a provisional chemical treatment train for which could be activated, if contaminant concentrations exceed allowable limits. 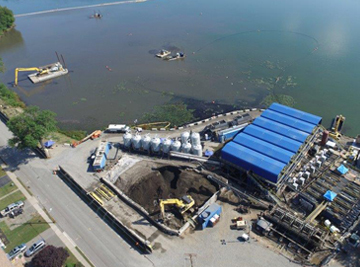 Collected water was discharged to the groundwater treatment plant for settlement and bag filtration to remove solids prior to discharge into the POTW. Sevenson provided real time, chromium monitoring to determine the necessity of chemical treatment. The dewatering system was designed to operate on a 24/7 basis during excavation and was housed in a temporary structure for year-round operation. Analytic testing was conducted to comply with permit requirements and treatment system operation. 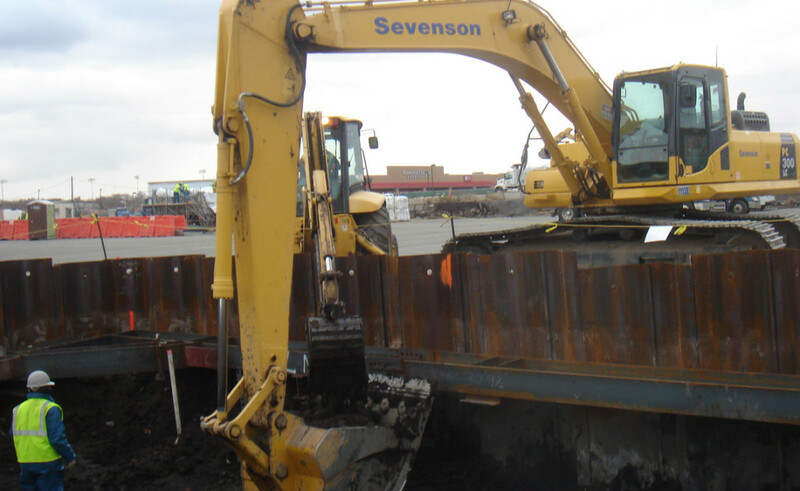 Prior to excavation, Sevenson pre-trenched the sheet pile wall locations to remove debris and obstructions. 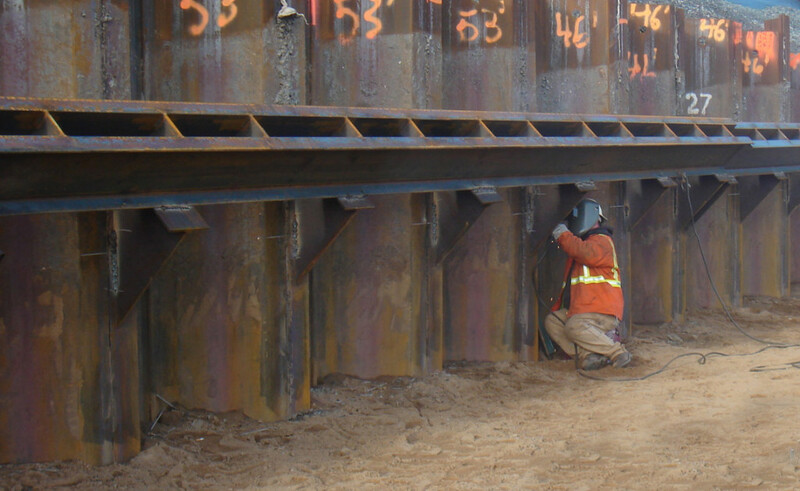 Low permeability sheet pile was installed as hydraulic barriers as well as protective shoring during excavation. 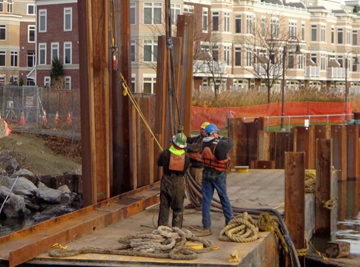 Drilled tension anchors, dead men tie backs, steel whalers and support pilings were installed; sheet pile joints were sealed in the field; and steel sheet pile was cut to grade. Truck liners were installed for direct loading into tandem trucks for offsite transportation and disposal or temporary stockpiling onsite. Visually impacted Pre-trench materials were sent offsite and clean material was combined with imported clean fill for compaction and backfilling of the area. A total of 2,400 lf of steel sheeting was installed. Sevenson demolished all site structures for either reuse or offsite T+D. This included existing asphalt pavement, concrete structures, footings, slabs, foundations, railway tracks and ties, and abandoned utilities implementing crushing, on-site recycling or stockpiling, as well as, load out of non-hazardous materials. Sevenson also performed a time critical hot spot excavation in the New Jersey University Parking lot that involved the removal of approximately 10,000 CY of chromium impacted material, backfilling with common fill and restoration with asphalt and concrete materials. 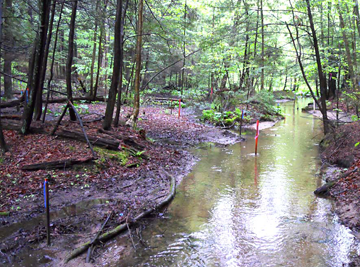 Work was sequenced to minimize impacts to the University and community. Sevenson installed a hydraulic barrier cap over the site. This required placement, compaction, and grading of fill material. 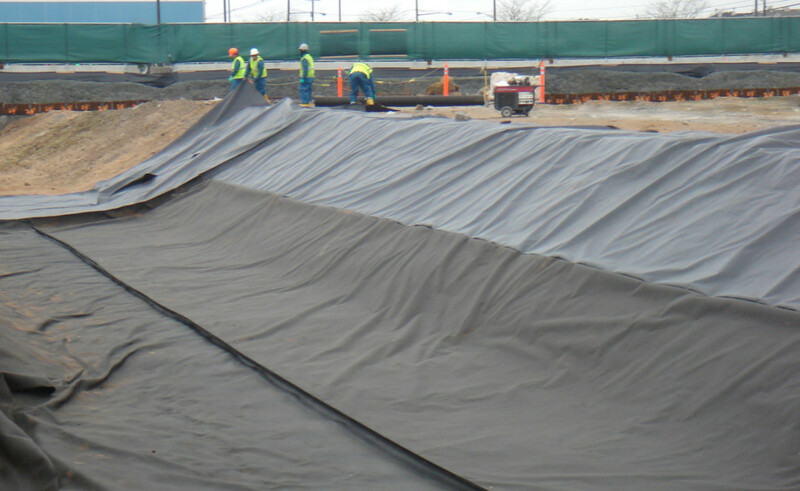 The cap system was comprised of geotextiles, geosynthetic composite layer (GCL) , geocomposite drainage layer (GDL), LLDPE geomembrane, common fill, protective cover soil, and cap underdrain pipes with discharge connections. An anchor trench was excavated and backfilled around the barrier cap to secure the cap system. New sanitary sewers were installed and included connections into existing sanitary sewer lines and manholes, and termination of existing lines as necessary. Additional items included restoration of staging and stockpiling areas, access roads and excavation disturbed areas. All temporary construction facilities and controls were removed and areas were either hydroseeded, paved or received crush stone as directed by the client. Additional restoration features also include the relocation and installation of a lighting system around the installed parking area. 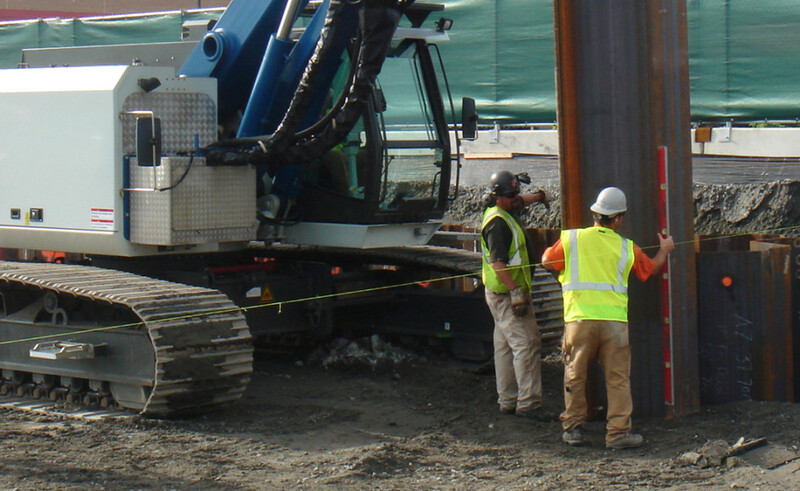 Sevenson performed Quality Assurance/Quality Control for soils testing and certification; hydraulic barrier testing and certification; health and safety protocols; personal protective equipment (PPE); traffic control signs; work layout; site and subcontractor supervision; sheet pile installation; coordination with other contractors and regulators during on-site inspections; temporary soil stockpiles management; equipment maintenance; dewatering, as required; as well as trash removal and clean-up. Sevenson furnished labor, equipment, materials, personnel, monitoring equipment, personal protection equipment (PPE), medical screening and monitoring in compliance with Health and Safety laws and regulations including, but not limited to OSHA 1910-120. 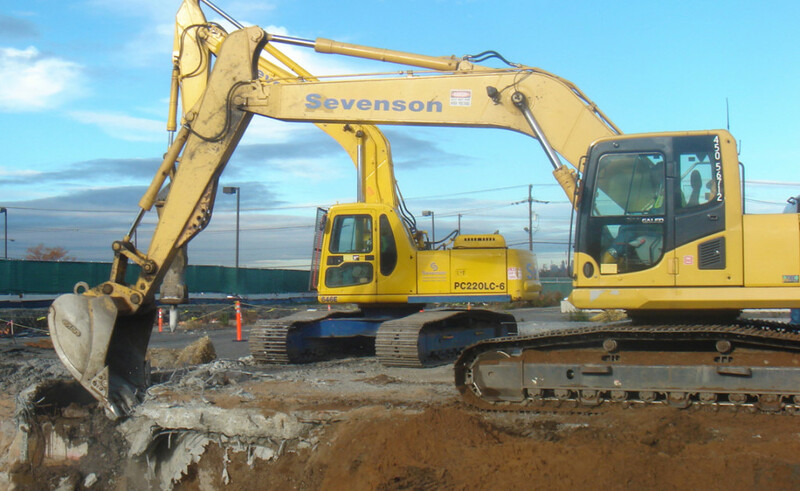 Sevenson secured all applicable contractor-related permits required for the execution and completion of work.